Absolutely fun. Tongue in cheek to dynamic humor coupled with some great number of recipes. Honestly, I would buy this for the recipes alone. I especially laughed at the elite and highly desired state of having your own family cemetery. And within several other strong connecting factors of food, there are immense parallels between this Southern paradigm and my Sicilian one. Even down to the cemetery placement dynamic. But especially with the food. Variety, degrees of multiple ingredients and complexity, NOT a store bought slick tray in sight. Although I do think there is a lot more wine in our version. I was laughing so hard at one point my husband thought there was something wrong with me--and I think actually came downstairs to investigate (shocking).I think it was when I was reading this part (I'm paraphrasing slightly here): Southern Episcopalians wear their devoutness lightly. Perhaps this is why they are so good at funerals. They know how to mix the casual and the formal, the proper and the relaxed (or perhaps the proper and the highly improper.) No where has this sensibility been better summed up than in the words of Anne Dudley Hunt. (Of course she was Anne Dudley Something-Else at the time. One Easter Even--that's Episcopalian for the day before Easter--Anne Dudley was hobbling around the kitchen bravely dyeing Easter eggs, despite her knees, which were bruised black and blue. "I just don't know," Anne Dudley said. "Did I hurt my knees yesterday afternoon doing the Stations of the Cross? Or did I do it falling down drunk last night?" That, in a nutshell is the spirit of Southern Episcopalianism.Good stuff.My brother heard the author reading this very excerpt on NPR and called me to tell me I needed to get the book (which I bought in our church gift shop), not knowing I already had it. Differences between the Methodists and the Episcopalians, etc. Some good recipes too--Baptist punch (no booze) Methodist punch (some booze) Episcopal punch (lots of booze). I gave this book a five-star rating because it made me laugh until my stomach hurt. As the child of a Southern Methodist Mother who (despite her worldly travels) remained forever true to the power of a good Methodist casserole, the anecdotes were "family stories" told be an other. Having a Damn Episcopalian Yankee for a father provided the additional perspective on the way funerals and their surrounding rituals are done on both sides of the Mason - Dixon Line. My conclusion aligns with the author's- they're just better with food and strong beverages to smooth the passing for everyone. If you lack the insider experience of the funeral reception as a chance to showcase one's hostess skills, lionize cousin India Pearl's latent attributes (Bless her heart! ), or just a basic ability to laugh at life's darker moments - this one probably isn't for you! This is a delightfully hilarious book that is exactly what the title says, complete with delicious recipes appropriate for taking to the home of the bereaved, wakes, or funeral receptions. The voice is pure Mississippi Delta, but anyone, especially if you're from the South, will recognize these people, traditions, and situations surrounding one of the most predictable of life's passages: death. I found myself laughing out loud more than once. The chapter on Episcopalians vs. Methodists was a scream. As with most really good humor, there is a lot of truth and wisdom here too, and the "guide" part of the title is, in my opinion, fulfilled. This was great fun and an easy read, especially if you skip the recipes and just read the rest. I never read so much about aspic (which, despite being Southern to my toes, I have never tried) or Campbell's cream of mushroom soup in my life. Which was kind of the point, I guess. This book is a mixture of funny essays about throwing a funeral in the Mississippi Delta town of Greenville, Mississippi, and recipes for "funeral foods." (Mississippi, by the way, is very fun to type) Some anecdotes had tears of laughter rolling down my cheeks as I recognized familiar idiosyncracies - especially the parts about Episcopalians vs. Methodists. I really enjoyed the author's good-natured skewering of the St. James Episcopal Church Ladies - although I can never let my mother read this book...she'd recognize too much of herself in it.Some of the recipes sounded interesting enough to try; many of them I'd sampled in person at one point or other in my lifetime of attending Southern events. I wish there had been a chapter on the "restorative cocktail"; I would have liked to have seen recipes for some of the drinks the author described. The book had no feeling of conclusion, though. It just sort of...stopped. I wish the author had put in a last little anecdote - some wrap-up tale of humorous woe, a "And that's how we do it in the Delta!" concluding paragraph. Other than that minor complaint, I enjoyed this book. It was a fast, funny, informative read. Being dead in The South has obligations for both the mourners and the dearly departed. The recentsly Bereaved are responsible for magically summoning food, drinks and compansionship for both the family and themselves. Sadly, it is a culture that is being lost as its accolytes pass on to their own Reward. It wasn't always that way and this book shows why. Thankfully, this book lays down the basics illustrated by anecdotes and memories. Even better are the old recipes interspersed throughout with such stalwart dishes ranging from tomato aspic to Harley's Pickles to Chocolate Chess Pie.There is humor, common sense and a Southern warmth that stuck memories galore in me. While I come from a different part of the Delta (Greenville is a bit too high-tone for my tastes and I still hold that Episcopals are merely Catholics who flunked their Latin), the rhythm and feel of the narrative rings true.Read it to sneak a peek at customs and culture that will soon be lost to this modern, bustling world we live in. It is hard to know whether to shelve this book under Thanatology or Cooking or Humour. 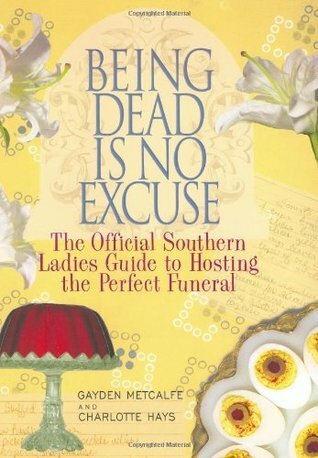 It purports to be "The Official Southern Ladies Guide to Hosting the Perfect Funeral." It delivers on that promise -- not only a hundred recipes for funeral dishes traditional to the Mississippi Delta but also advice on hymns, flowers, notes, and all those other social graces which sort one into the upper and lower classes. Who knew there was such a dish as Bing Cherry Salad made with Coca Cola? Who knew that one may achieve a shortcut to tomato aspic by using a can of Campbell's Tomato Soup? Why do Episcopalians get to have cocktails at the reception when Methodists don't? The answers to these and many other important questions appear on these pages. And if you don't think this book is funny, you either know absolutely nothing about the American South or there's jus' somethin' real wrong with you. Southern women, funerals and a lot of mouth watering recipes. A fun read! The title of this book is what caught my attention. Half cookbook, half humorous commentary on how southern families and communities cope with a death, it was a nice change from the heavier subjects that constitute my usual fare. From the planning of the funeral to the preferred hymns to differences in thoughts on bereavement from several Christian denominations, this book covers it all with wit. I found myself laughing out loud a few times.The recipes are those most often prepared for the grieving families and they are pure comfort food. Most of them are either full of sugary sweetness or abundantly crammed with fats and/or carbohydrates, but are sure to sustain everyone through those distressing times. Apparently pimiento cheese is a particular favorite among the Delta crowd; the book includes six recipes for that dish.This book manages to put a little levity into a somber subject without being disrespectful. This book is a lighthearted read, bringing laughs and chuckles and remembrances of recipes all having to do with Southern funerals. The title indicates that "being dead is no excuse to have a poor funeral". So you should plan, be prepared, and make use of the tips and advice from these two Southern ladies. If you are from the Mississippi Delta area, or have family in the deep South, then you will find common ground laughing through chapters like "The Methodist Ladies vs. the Episcopal Ladies" and "Comfort Foods: There is a Balm in Campbell's Soup"!Advice includes what kinds of music to use or avoid (do have "O God our help in ages past", "Lift High the Cross", and "For All the saints", but avoid "The Battle Hymn of the Republic", "Beautiful Isle of Somewhere", and "On Eagle's Wings"). Wondering what flowers are appropriate? Avoid carnations with or without glitter or any eternal (artificial) flowers. Traditional bouquets of roses or a covering for the coffin woven from yardlike flowers are deemed very tasteful and appropriate for the well-bred Southerner. A last word of advice? "A good rule of thumb if you want to have a perfect Southern funeral: No hymns composed after 1940"!The section on appropriate funeral foods is really where this book made me laugh hardest. "The Eternal Pantry -- A legacy for your children" has lists of foods to have on hand so that you are ready at a moment's notice to whip up that comforting funeral food for the family left behind. A slightly different pantry is stocked by Methodist ladies (boxed cake mixes and cream soups are staples) than is stocked by the Episcopal ladies (no store bought mixes). Items include ritz crackers, yellow cake mix, green beans, cream of mushroom and chicken and pretty much ANY creamed soup, French's canned french fried onions, pimentos, and slivered almonds. A note at the end of that section indicates that "if you combine any three items of like value on this list, you're likely to have made a funeral casserole"!In each section, detailed recipes are included, which include my favorite "Vodka Cake" (prepared by the Episcopal ladies), the Methodist Ladies' Chicken Lasagna Florentine (butter pecans on top of lasagna?!?!? ), poulet John Wesley (fried chicken, THE ecumenical dish), and Can't-Die-Without-It Caramel Cake.Inbetween recipes, songs to sing (or avoid), are hilarious happenings at various funerals. In many I seemed to recognize some of my own relatives, for good or ill!So I recommend this book for a good laugh and some good recipes! And I think I'll go check my pantry now to make sure I have the appropriate funeral comfort food! Look, all of us who live in the South know the world perceives us as a bit "different." We have rules and codes of behavior for things the rest of the world ignores. But the fun comes when someone in the know,like Gayden Metcalfe explains those rules to the rest of the world and why making and breaking those rules can be a source of joy.This book lightheartedly explains the South's great codification of and obsession with Death, a significant part of life below the Mason/Dixon. As tornadoes were the catalyst for social events in prairie childhood, so a visit from the Grim Reaper is here. There are the appropriate goods to offer the bereaved, (And Thank God, this book has recipes!) the appropriate remarks to make ("He don't look like hisself" is required in some areas) and the convoluted rituals we follow before we drop someone into the ground. (Hint: we can't have a funeral without potato salad) All of this is explained with a comic touch and true understanding of the Southern Soul. Find the book and read it before you make another trip here or have to unpack your good black dress. It will help put the fun back in funeral. I read this book as a research book for a play I'm writing. It was a surprise to learn it was a cookbook with spirited essays about the culture of southern delta funerals, centered in Greenville, MS. I knew about any true southerner's affection for the cocktail hour, the libation Olympics. They celebrate most anything and everything with a gusto not matched anywhere in the world, but I did not know about the casserole wars between the stalwart Episcopalians and the mild and meek Methodists, though. The recipes laden with Campbell's cream of mushroom soup made my stomach cramp at the thought, sorry Ms Metcalfe.In the end, I liked this well-written book in a southern vernacular that recalls dialogue from a Tennessee Williams play. In competition for a family burial plot, a lady would up and die early to claim the piece of real estate, first. I don't know if it was the author's intention, but she gave view through a large picture window to a small region of our country that holds dear to tradition and manners, sadly, quite lacking elsewhere. I love etiquette books, and this one had such a unique angle. It's full of recipes, which I probably won't try because I don't like cream of mushroom soup, but I'm exceedingly curious about aspic--tomato juice, horseradish, and unflavored gelatin? Intriguing. Some of it reminded me of Texas, like when you say "pop" instead of "co-cola" and everyone laughs at you and calls you a Yankee. But mostly I liked the funny stories in this book. Like this: "In 1905, Joshua Ridgeway was shot and killed in a barroom brawl in front of the old Hotel Greenville. For his tombstone, the family selected 'Blessed are the Peacemakers.' It was an inspired choice. While it doesn't actually deny that Mr. Ridgeway died in a vicious gunfight, in which he killed two other gentlemn, it does imply that he just happened to be in the wrong place at the wrong time and might even have been engaged, unsuccessfully, in trying to talk the other parties into laying down their arms. Of course, they would have known better than to fall for that." My inner voice has been talking in a drawl since Tuesday. Memories of Southern Style funerals came flooding back except that we didn't have any plantations where I came from but many of her stories caused tears of laughter To roll down my cheeks. My third cousin who was a lot older than me but as fun as she could be was always worried that another cousin might get her spot in the family cemetery and constantly talked all of the nerve if the other cousin who might precede her in death. The food descriptions are perfect and true recipes for " the Dead Spread". My own mother decided that she be darned if she was going to be buried by either husband and decided to return to her family cemetery out on the lone prairie of the ghost town of La Casa, Tx. So that is where we took her ashes and as soon as we hit the Texas border, I sang " Deep in the Heart of Texas"" as her homecoming song. Her tombstone has a Lone Star carved on it with the epitaph " Always a Texan"" she was proudest of her Texas heritage . A delightful book about a tasteless subject!!! Loved this humorous take on funerals- Southern style. I have been part of the "funeral biz" through my work for a few years so this hit home- especially the food, the hymn choices and the uniquely southern traditions to being buried in the South.In the style of Fannie Flagg's take on southern traditions, this is a laugh out loud book.A must read for any true southerner, or someone who wants to understand their culture. Thought this would be a lot funnier than it actually was. Was written very tongue-in-cheek but that got old after a chapter or two. Recipes were included after each section, but most sounded quite unappetizing and were pretty old-fashioned. The book as a whole smacked of old-fashionedness, as a matter of fact.Didn't care for this one. And I'm from the south! I actually really liked this book, although I wish there had been a few pictures included of some of the recipes.I actually made the tomato aspic recipe from the book, and it turned out even better than expected... assuming you like aspic. Which most people I know don't. The stories were great, and this was just a really enjoyable and easy book to read. I'm serious as a heart attack when I say this book fell off the shelf of the non-fiction area of my library. I looked around and there was no one around! I walked over to put it in the proper place when I read the title. I had to check it out! The book was quirky fun, but the majority of the recipes did not appeal to me. Overall fun 3.5 stars. Wow! This is a book my husband read first and I couldn't wait to get my hands on it. My Mama is from Shreveport and my Dad from the Bronx. Needless to say the southern traditions had precedent! This book rang true in so many ways and the recipes will be used. One thing though... this now Texan girl can't stand tomato aspic! Irreverent, written in tongue-in-cheek, this guide to the prefect Southern funeral will have some readers laughing. It just wasn't my cup of tea. I read the first 100 pages or so and skimmed the rest. The recipes are interesting, but there aren't many I'd personally care to try. Other people might enjoy it, but this just wasn't for me. So typically SouthernThis book certainly gives insight into the traditional Southern send-off of those who were born to the traditions of the Southern funeral. A fun read even for those poor souls not native to our definitely Southern traditions. Very funny, and loads of yummy recipes, I'm even going to use one for our thanksgiving feast. Totally funny! Buy the book for the Southern recipes that you can make and then laugh about where you found them! Quick read. It was a good book. Super fun for our book club - we talked funeral etiquette. Some of its ideas and themes are a bit dated, and might not be exactly PC, but overall a fun read and GREAT recipes. This was the perfect "summer pool read!" Funny and easy to pick up where ever you happen to stop reading. I also enjoy reading recipe books, and this is filled with quite a few Southern goodies!